Most good shooters use mirage as their leading indicator to spot changes in the wind. With well-designed stand, the scope can be set it up where you can see the wind with the left eye and see the sight with the right without anything more than a visual focus shift. That gets the shooter back on the trigger with the least chance of missing another change. 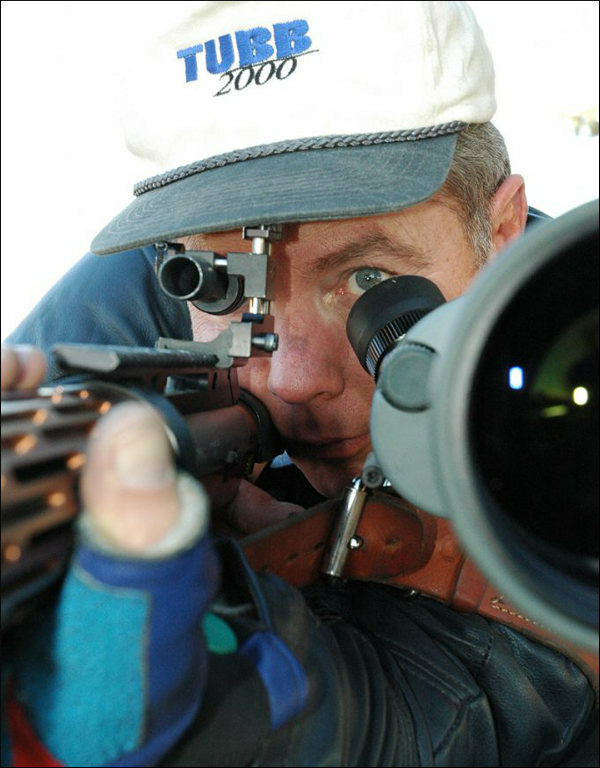 In the photo below e you can see 11-time National High Power Champion David Tubb using a spotting scope set up for his left eye. David Tubb sets up his spotting scope so he can easily see through it with his LEFT eye, without shifting his head and body position. There are resources that give clues or evidence of wind direction and strength: wind flags, observation of grass and trees, and mirage. Almost always I use mirage as my leading indicator. Mirage (heat waves) is always present but you’ll need a scope to read it. For 600 yards I focus my scope about halfway to the target. Mirage flows just like water and the currents can be read with respect to wind speed as well, but it’s not clearly accurate beyond maybe a 15 mph speed. The thing is that mirage shows changes, increases or decreases, and also direction shifts, really well. A couple more things about mirage flow: when mirage “boils,” that is appears to rise straight up, either there’s no wind or the scope is dead in-line with wind direction. And that’s a quick and accurate means to determine wind direction, by the way, move the scope until you see the boil and note the scope body angle. Here’s another tip — the boil can predict when a “fishtail” wind is about to change, a boil precedes a shift. You don’t need to spend big bucks for an effective spotting scope to view mirage. 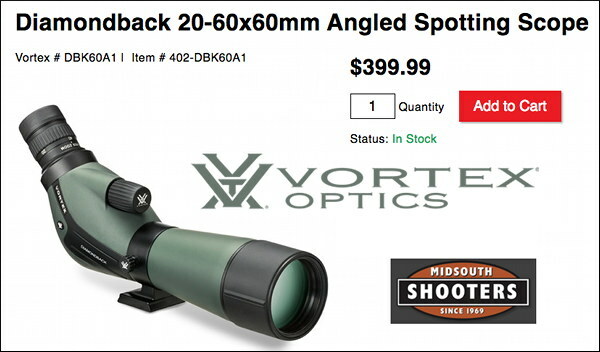 You can get the Vortex 20-60x60mm Diamondback angled spotting scope for just $399.99 from Midsouth. That’s complete with 20-60X zoom eyepiece. Though inexpensive, the Vortex Diamondback is popular with many competitive shooters and hunters. No, it doesn’t offer the sharpness of an 80mm Kowa Prominar or Swarovski spotting scope, but you’ll pay $2400+ just for the body of those high-end optics. I use a long-eye-relief 20X to 25X wide-angle eyepiece. That setup shows the flow best. And pay attention to where the wind is coming from! See what’s headed your way, because what’s passed no longer matters. That’s true for any indicator. Right to left wind? Read off the right side of the range. Once I get on target then all I am doing is watching for changes. It’s really uncommon to make a big adjustment between shots. The fewer condition changes you are enduring, the easier it is to keep everything on center. That’s why I shoot fast, and why I start at the low point in a wind cycle. Information in this article was adapted from material in several books published by Glen Zediker and Zediker Publishing. Glen is an NRA High Master who earned that classification in NRA High Power Rifle using an AR15 Service Rifle. For more information and articles visit ZedikerPublishing.com. 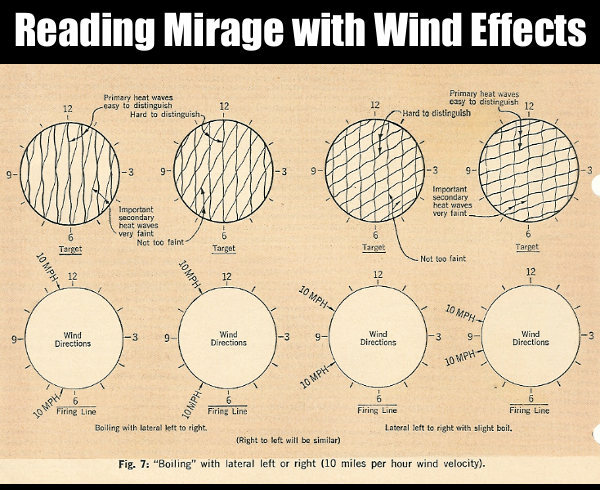 Share the post "“Mirage Is Your Friend” — How Mirage Can Reveal the Wind"
I’ve found it best to use a rifle scope on a tripod instead of a spotting scope. The advantage is that with parallax eliminated you can not only read the mirage, you can also spot the target displacement caused by refraction. I also have a 24X lens on my camera and feed the video into a monitor on my shooting bench and use rubber bands vertical and horizontal to serve as a reticle. Bottom line is that your point of aim is always the reticle on the tripod optic… whatever method you choose. I hope the above makes sense to you guys.